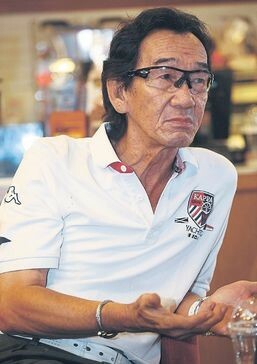 Legendary goalkeeper Chow Chee Keong passed away this morning at about 7 am this morning. He would have turned 69 on Nov 26. May his soul rest in peace and the Lord grant him eternal rest. As a tribute reproducing an interview I did with him four years ago which appeared in The Malay Mail. The scribe with Chee Keong (first left) eight years ago at the UKRC function. 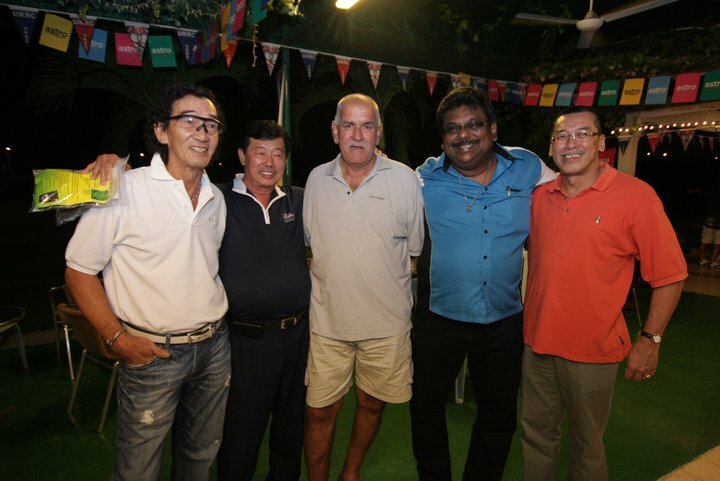 Next to Chee Keong is another legend the late Wong Choon Wah, Datuk Santokh Singh and Yip Chee Keong. But despite an illustrious career which included being named Best Goalkeeper from 1966 to 1970 by the Asian Football Confederation, Chee Keong has regrets and it is because of that he is now involved in golf. 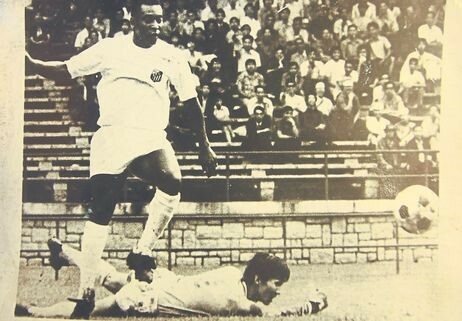 Chee Keong makes a save off an attempt by the great Pele. Chow Chee Keong is a rare breed among Malaysian sportsmen, but there is not much records of his career. Last week, in an exclusive interview granted to MM Sport, he revealed many things not known about him and set many records straight. The 64-year-old Chee Keong who rarely speaks to the media, opened up this time around and had so much to say that it was decided that a second-part the interview was fitting to make his story complete. In this second-part Chee Keong, talks about local players, football administration and local fans. IT was an era where goalkeepers were many and extremely talented, but Chow Chee Keong still emerged the top custodian. There was Lim Fung Kee, Wong Kam Fook, the late R. Arumugam and Ong Yu Tiang and Rashid Hassan who came to the scene a little later, but Chee Keong remains the best goalkeeper ever to grace for Malaysia. Not only was he voted Best Goalkeeper from 1966 to 1970 by the Asian Football Confederation, but he was sought by top Brazilian club Cruzerio FC. Pele whom Chee Keong played against on numerous occasions when he was plying his professional trade in Hong Kong, who became his good friend, had many kind words of his performances. Chee Keong was instrumental in many other Malaysians who followed suit to play in Hong Kong which included Fung Kee, Kam Fook, the late Wong Choon Wah and Yip Chee Keong. “These players approached me to help them find clubs in Hong Kong and I did. But sadly, many of them blamed me in bringing them to Hong Kong when they ran into difficulties coping with the local conditions,” revealed Chee Keong. “Naturally the local players were not happy with us Malaysians playing in Hong Kong. They made it difficult for us, and became their target in matches. It was no different for me when I first went to Hong Kong, where I had to use my martial arts skills in goalkeeping to prevent myself frm getting injured. Chee Keong said some of the Malaysian players who came to Hong Kong were not mentally strong and soon went into depressions and wanted out. Chee Keong said that Malaysian players should strive to play overseas because all over the world the better players play in leagues outside their home country. “That is the only way to improve one’s game and all the challenges they are faced with, will only make them better players. “It is sad that I hear that many Malaysian players who have had the opportunity to go overseas have returned sighting weather conditions, food, language, missing home and not being able to stand the tough training or blending with the team. “As long as this continues, Malaysian players are not going to improve and reach high standards just playing at home,” stressed Chee Keong. He took a dig at present day athletes who take things for granted and are pampered lot and who do not know what sacrifice is all about. “I cannot believe that present day sportsmen and woman and lack ambition to improve themselves and reach for the highest level of performance. Malaysian football, in fact he hopes all sports are administered by sportsmen and women rather than politicians and ones who do not have a clue of the sport. “It is sad that many sports associations are run by people who do not have a clue of the sports or are not sportingly orientated,” said Chee Keong. “Many helm the sports for their own personally gain or just to be popular and enjoy the benefits. He also took a dig at present day athletes who take things for granted and are pampered lot who do not know what sacrifice is and do not have ambitions to improve themselves. “Malaysia is very lucky to have loyal fans who pack the stadium week in and week out despite the poor quality of football dished out,” said Chee Keong. “It is about time that something is done for the fans so that they get their money’s worth. “Right now they are being cheated as the football is of poor quality. “The governing body, the coaches and players have an obligation to treat the fans to better quality games. “These people have to remember that the day the fans despite to walkout on them, they will be playing to empty stadiums and the football will fall flat in country.